My Child WON'T Be Punished For Other Children's Bad Behaviour! A couple of weeks ago I got into a public debate on my personal Facebook page which seemed to of got a few people rather frustrated. Anyone who knows me knows that I'm outspoken and not afraid to speak my mind, and when it comes to my child, I'm the first to admit that only I know best for him, no one else on this earth knows my child like I do, including his father! 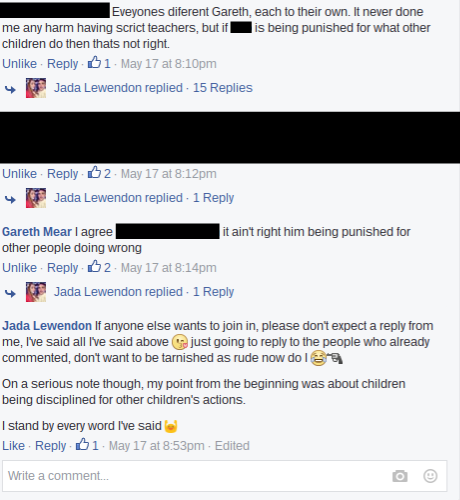 I put a status up on my own Facebook profile about children being punished for other children's bad behaviour, some of the comments left on my status was rather shocking. Let me explain what my status was about. A teacher shouted to a whole bunch of children if pushing wasn't stopped then everyone would be returning to their classroom. Not because he's my child, but because he didn't do ANYTHING wrong! Well he never has and hopefully never will, because I will kick up a storm! I'm not afraid to air my voice or opinion and I'm not afraid to stand up for a child when it needs to be done! If my child is being taken back to a classroom then best believe it's because of something he's done, and not because of something another child/group of children have done. All of Spud's school life I have been told a countless number of times by teacher after teacher how well behaved he is, myself, family and friends can agree, he is such a well behaved little boy, of course he has his moments but who doesn't? We need to remember that us adults have down days, we have moments where we have grumpy moods, bad attitudes and we act differently, but I don't hold that against my child and say he's naughty, he has a downish moment around once every six weeks, it's usually because of a game he is struggling with, but my point is, we need to stop holding our children to a higher standard of perfection than we attain ourselves, we're all human - no one's perfect! Back to the story about the Facebook debate, homework was also mentioned. I see home time as HOME time, not home to do more work, but home to chill out, to enjoy time with the family, home time to enjoy your parent's favourite meals, for quality bonding time and much more. I believe education is vital and without education, I wouldn't be where I am today, but I don't believe in homework. Reading is fine, helping me with the cooking/baking is fine, it's helping Spud learn valuable life lessons, he has a bookcase that can't hold all of his story books, then he has a storage box full of educational books, we go out on the weekend to visit tourist attractions - many that hold years of History behind them, and even a trip to the park can be educational when you come across some of nature's insects, so Spud is still continuing to learn at home, in many different ways, but in ways that he chooses to. School isn't the most pleasant of places to be, as a child I hated school, if there's a stronger word than throw it in, and that's fine. 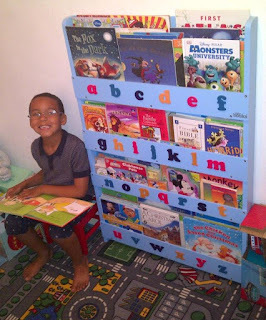 I don't know of many children that LOVE school, enjoy it to an extent yes - but love it no! Even if I did come across a child who loved being in school more than being at home, I'd think I'd be worried with what sort of homelife the child had - but we'll leave that for another day. Some of the comments left on my status was people agreeing with me, some not so - which is fine. I am one of the first to tell others off for not allowing others to have an opinion, I couldn't imagine the world if there wasn't debates, I was on the Youth Parliament team for a reason, later making the Roll of Honours for my local council. If I didn't have a child, I could just imagine me sitting in the Houses of Parliament having a debate on a weekly basis, I find them very interesting. 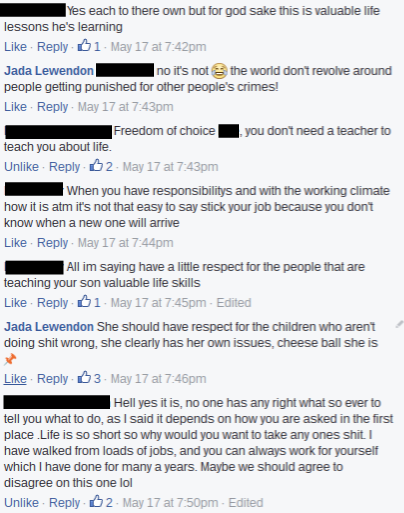 Not getting into politics, let me show you some of the comments, without mentioning names of course. A valuable LIFE LESSON!? Oh yes, I'm just going to teach my child that he should totally get punished for other people's behaviours! This isn't a valuable life skill or life lesson! 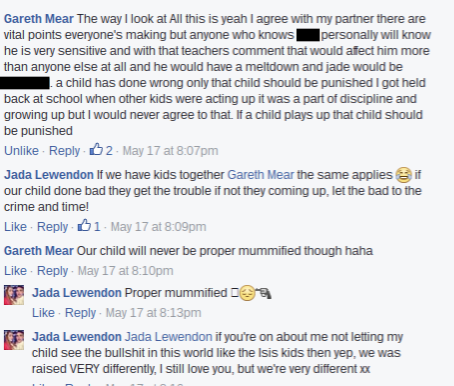 This person clearly wasn't getting my point, my child isn't going to be punished for other child's punishments! 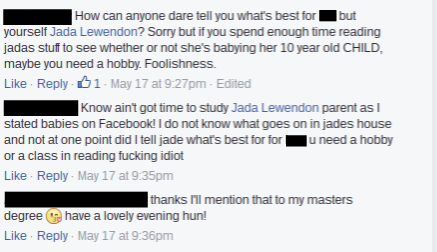 Then Gareth (my fiance) got involved, and as you can see we clearly have different parenting views, babying a child and keeping adult drama's away from a child is two totally different things! Children are innocent and until they know otherwise, the world is a good place. Then things started going down a different route, and me and this said person had already made it clear it was just a debate, no hard feelings, this was a whole different kettle of fish. I then decided I had spent enough time and my view clearly wasn't getting across to certain people so I ended the debate there. However, I then went onto ask some bloggers what their thoughts on the opinion was, and this is what I got back. I saw your post and was going to comment but thought I'd better not. I totally agree with you. I would not be happy if my sons were punished for other children's behaviour. Like, in life, if a colleague was to do something wrong, you wouldn't be blamed also, so why should children? I think just the individual should be punished. Why the fek should my son be punished because some other brat cant behave!!!! In high school, our whole class was made to return for detention because somebody, er, passed wind (no delicate way of putting that really, is?!). The teacher was a tyrant and only aware because of an apparent bad smell - despite the fact we were in a chemistry class! I can remember very clearly getting annoyed by this when I was about your son's age & complaining to classmates about 'blanket punishment'. It just causes resentment & teaches absolutely nothing apart from learning that life isn't fair or just. I think some teachers see it as the kids dont want all their classmates to hate them so by punishing them all they will think twice in future so their friends don't get angry with them. Does that make sense? Lol not that I agree with it at all and I would be fuming if my child was punished for anothers actions. I don't think kids should be punished for others actions. Pre punishment never works and sometimes encourages kids to be naughty seeing as they will get in trouble anyway. Very 'full metal jacket'. I think this just assumes (hopes) that either the bad child feels guilt or, much worse, the rest of the class 'sort him out'! It is passing the burden of punishment onto children. It's wrong and lazy imo. With every single blogger agreeing, I think it's fair to see that most parents agree with their children not being punished for other's crimes. What I know for certain is, it will never happen to Spud with my permission thats for sure, and if it happens regardless, I will kick off the biggest stink going, it's not on at all! I don't mean just at school either, this applies to family and friends too ! Punish the bad and reward the good! What saddened me also, was the amount of people who messaged me privately with their views, agreeing but not wanting to get involved due to fear, I think it's sad that people can't have their voice in today's society! This leads me to my final sentence, which is a question to my readers, do you agree with children being punished for another child's/children's bad behaviour? 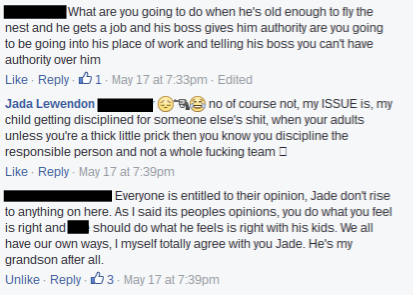 I'm agree Jade, and I've made this clear to the teachers at my children's (secondary) school more than once. If my child comes home aggrieved that they've been given a detention because someone else has been naughty, talking, disruptive, late etc then I send a note in to school stating that my child won't be attending that detention on MY say so. I add that if my child is talking, naughty or disruptive, hasn't done their homework, hasn't finished their classwork... and so on... then by all means, they can be detained. But they're not punishing my child for other another's behaviour. What sort of message does that send? All it does is alienate the child that has caused the trouble in the first place, potentially leading to bullying. I have to disagree, sadly. Of course, I can only comment on the exchange itself, and what I've cobbled together from the above - but I think collective punishment is fine within a school setting. If the punishment levied was disproportionate (i.e dententions) then this would be wholly wrong, but simply asking the children to return to their rooms and exit in an orderly fashion seems fair enough to me. I totally get your point about homework though. In a primary school setting, this seems unfair (I know I didn't homework until secondary school). At secondary school however, essays and coursework will make up a percentage of Spud's final grades. As long as he has some exposure to this with you, that's fine - I just don't think he'll get away with not doing it when he moves up through later educational settings (unless of course you go down the home school route). With punishing I think it depends on the circumstances and what exactly the naughty child has done which has resulted in the whole class being punished. Cuz sometimes the whole 'I am my brothers keeper' does apply as I do it with my 2. Depending on what one of them has done I will punish both of them for eg: If RD has been rude to me and I've warned him bare times it can result in them both not going swimming because I find (with my 2 anywayz) if one is being punished thay way for something they didn't really do they make it their business to talk to (or threaten) the other one so that it doesn't happen again and they don't miss out on another treat because of the other ones bad behaviour so they kinda keep eachother in check. I think sometimes kids can more listen to their peers so if a whole class gets punished most of that class is gonna have a word with the naughty one and prob prevent it from happening again. But if that naughty child has done crazy like throw a chair at a teacher and trash the classroom (an extreme example but something that could happen at my kids school) then my child shouldn't be punished for that, the individual child needs to be held accountable. With regards to homework my 2 do homework every day regardless of it they get it sent home from school or not. I know from experience black boys are not pushed acedemically at school and I refuse to let my son be a statistic so I fill his head with knowledge at home but with me I've never been one to rely on schools to teach my kids everything.Like black history cuz I know schools ain't teaching that. Both of mine love learning and they have fun workbooks. It's only for about 10mins max (as they're small and have to take their attention span into account) but as they get older I will give them more homework so that by the time they start secondary school all thay homework won't be a shock to their system. My mum did the same with me. I always had homework and it worked in my favour in the end.